According to data of the Research Center for Zoology and Hydro-Ecology, about 60 percent of wild animal life in Armenia is threatened. “The major threats to biodiversity are directly or indirectly connected with human influence. The major processes threatening it are the loss of living environment and its change, overuse of biological resources, pollution, etc. All these threats minimize the population of the flora and the fauna, and cause loss of species, degradation of landscapes and ecosystems,” the annual report of the Ministry of Environmental Protection says. The gray-necked pochard has disappeared altogether, the panther is on the brink of disappearance, mouflon (sheep), Bezoar goat (ibex), gray bear are also in jeopardy. Also extinct or in danger are such species as alpine turkey, golden eagle, steppe eagle, flamingo, black stork, forest cat, bear, and others. Aram Aghasyan, head of the department for coordination of natural areas under special protection, Ministry of Environmental Protection, says, however, the last cataloging of fauna was done in the Soviet years. The National Academy of Sciences has only catalogued the fish resources since 1991 – a source of information for the Ministry. “No fauna inventory has been done in Armenia for the last 30 years, so it is impossible to make comparisons and give even an approximate picture. It’s a field still not reaped,” says the chairman of the Greens’ Union Hakob Sanasaryan, underscoring the fact that much of the research is more than 20 years old. Research secretary of the NAS Research Center for Zoology and Hydro-Ecology Hasmik Khachatryan says vanishing fauna is a natural process mainly caused by human and ecological factors. “My personal opinion is poaching can’t cause as much damage as the environmental problems; on the one side are the industrial exhausts, on the other are the forest loggings and toxins used in agriculture that make animals face the threat of extermination,” explains Khachatryan. While there is no research to show which animals are affected by which chemicals, it is understood that the increase in agriculture-related toxins have caused wildlife to suffer. Georgi Boyakhchyan, director of the Zoological Institute believes the largest species of animals will always be threatened because they need vast areas for reproduction while areas grow smaller. He says the narrowing of areas also causes scarcity of food for animals. Forestry specialist Karen Afrikyan of the Armenian Forests NGO also says the food resources for animals have decreased because of the years of logging forcing many animal species to migrate – most likely to Iran and Nakhijevan. Aghasyan says there are animals that do quite well, but some are in a disastrous situation. Nazeli Vardanyan, chairwoman of the Armenian Forests NGO points to the wide spread loggings of the 90s and the industrial loggings of the last decade that have been another serious attack on the fauna. Martin Adamyan, director of the Zoological Museum thinks the main victims of the human efforts for area developments are the water animals. Adamyan says animals are very ‘stubborn’ and survive even in minimal conditions, but it’s most likely we have not left the minimum either. Hakob Sanasaryan says human factors largely add to the poaching. “Poaching with us today is a monopoly of wealthy people and state officials. The hunting in places banned for it by law is done by those who are considered to stand above the law,” says Sanasaryan. Karen Manvelyan, head of the Armenian branch for the World Wildlife Fund also says the poachers in Armenia are mainly representatives of power structures and military. The latter is fixed by the cameras installed in the forests by the WWF. The major aims of the poachers are bears and horned animals - mountain sheep, goat, deer. “Everyone possessing weapons before 1996-1997 used to shoot and hunt. Wide spread hunting has vanished now, but another kind has grown: oligarchs exterminate horned animals and even compete in weight of the killed animals,” Sanasaryan complains. Killing the biggest animal is comparable, he says, to having the newest model car. Vanik Grigoryan, head of the regional department for the State Agency of Natural Protection of Vayots Dzor province supports the information that the number of poaching cases has dropped, but recalls a criminal case was brought into action in 2006 against a certain Yeghiazaryan for hunting sheep. However, the locals say, though fearful of identifying their names, the hunter was Ishkhan Zakaryan, now the chairman of the Control Chamber of Armenia. Aram Harutyunyan, the Minister of Environmental Protection denies absolutely that officials are engaged in illegal hunting. “It’s more talks. In reality it is not the case. We supervise any kind of hunting in the strictest way and give proper proceeding. Several months ago, for instance, we revealed a case hunting three deer. Our guys spent all the night to catch the violators. We caught them and brought a criminal case into action and handed it over to the Prosecutor Office,” says Harutyunyan. Restaurants operating on the roadsides of the highways to provinces also witness the existence of illegal hunting (like ‘Vorskan’ [‘Hunter’] restaurant in Vayots Dzor) that offer meals prepared of meat of animals banned for hunting. The careless treatment of animals is witnessed also in some entertainment places (like the bar and restaurant at the ‘Viardo’ resort complex in Tsakhkadzor), where halls are decorated even with the stuffed animals that are included in the Red Data List – brown bear, mouflon (sheep), Bezoar goat (ibex) and others. “Yes, supervision is done, but we know, people secretly shoot deer, wild boars, bears and sell to restaurants,” Sayat Davtyan, late chairman of the Hunters and Fishers Union said in his last interview. Aram Aghasyan says however the number of poaching cases has dropped. “We register 1 or 2 cases of poaching in the preserved areas against the 10-15 cases in former times. One of the reasons is the Law on Hunting passed in 2006 as well as the increase of the budget of preserved areas for 7-8 times,” he says. He says foresters used to get 7-8,000 drams ($22-25); but today their salary makes 40 – 50,000 drams ($130 - 160). He says technical mechanisms of supervision have also been improved; preservations and reserves have transportation means, binoculars and proper garments. Minister of Environmental Protection Aram Harutyunyan also says the poaching has decreased in recent years. “Whatever we have today in fauna is a result of the policy of the ministry. It particularly coordinates all the works and has set a strict regime against poaching. We can go to Vayots Dzor province, to the village of Shatin today and see Bezoar goats roving. It’s a big success,” Harutyunyan adds. Nelli Baghdasaryan, head of the department for statistics in social and environmental spheres at the State Statistical Service says, though, the number of registered cases of violation of hunting rules in 2006 has been 93 against 14 in 2000, which means the number has grown for 6-7 times. On the one hand this means that the law has begun working, but at the same time it means that the number of cases is increasing, as in the past hunting was controlled by other laws connected with the environment. 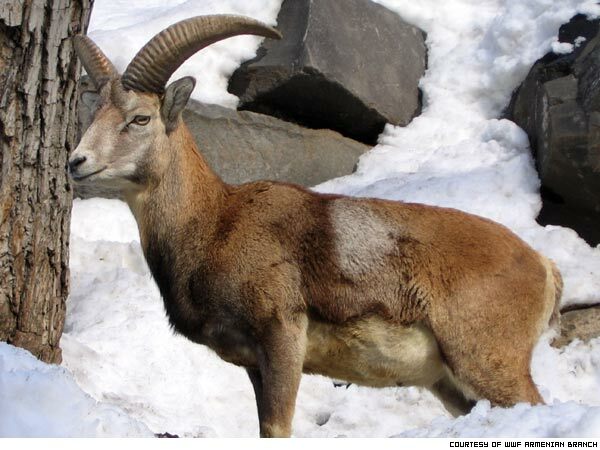 Of the 500 species of vertebrates of Armenian wildlife threatened today are Armenian mouflon (sheep), Bezoar goat (ibex), brown bear, Caucasian leopard (panther of Asia Minor) and others. Mher Sharoyan of Armenian Forests NGO says the latter is the rarest animal of the eco-circle with only 35-40 animals in the Caucasus region. Environmentalists say panthers in Armenia can be counted on fingers and can rarely be seen in the mountains of Vayots Dzor and Meghri mountain chain. “Mouflon and Bezoar goat were exterminated mainly in 1992-1995. People used to tell me there were so many animals in Areni (a village in Vayots Dzor province) before the 90s that their herds used to come to the village,” Sanasaryan recalls. Igor Khorozyan, head of the program for evaluation of status of mouflon and Bezoar goat of the Foundation for Cooperation of Ecosystems in Critical Situation says his last studies show there are 2,000-2,500 Bezoar goats and 200-250 mouflons, an endemic specie, in the mountains of Armenia today. “Due to the lack of clear inventorying in previous years it is now hard to say if the number of those species has grown or not. But presumably it has been significantly larger before the 90s,” mentions Khorozyan. “Those species survive mainly by means of providing specially protected territories and through the efforts of provincial agencies. But the areas are so few that it is impossible to imagine how a proper population of those species can be produced,” says Karen Manvelyan. The Khosrov state reserve is one of three in Armenia after the Erebuni reserve in the suburb of Yerevan and Shikahogh in Syunik province. The 3 reserves in total have 39,285 hectares, which is 1.2 percent of Armenia’s territory. Armenian mouflon and Bezoar goat are known in Armenian plateau since prehistoric times 4 – 10,000 years ago. The best proofs of it are the dozens of rock paintings of those animals in the mountains of Geghama chain and Ukhtasar. The animals live for 10-17 years and weigh 60-100 kg. “The sheep breed in Armenia has remained very pure. Its main range of population is Armenia, therefore Armenian mouflon, a valuable and endangered type of sheep, is of major importance,” Adamyan explains. The Bezoar goat received its name for the bezoars – balls produced by mineral extracts of food in the goat’s stomach once used in folk medicine. “Mouflon and Bezoar goat have been and will remain in the Red Data List. A minor improvement in the panther’s situation has been registered. The latter is conditioned also with a small growth in the number of mouflons and Bezoar goats as they serve as food for panther,” says Hasmik Khachatryan. The Bezoar goat and Armenian mouflon in Armenia inhabit the south-western part of the Geghama mountain chain in the mountains of Urts, Vayk, Vardenis and the south-east of Zangezur mountain chain on the territory stretching up to Iran. Adamyan mentions the state undertook preservation of these animals in the area of Urts by creating the Khosrov reserve, which, however, is now under the joint Armenian-Italian Safari International engaged in hunting business headed by the head of province administration of Vayots Dzor Vardges Matevosyan. This territory is both a good place for hunting and has more than 10 historic and cultural monuments. “According to the information I have the guards of the Safari Company are the ones who hunt. They also allow others to hunt animals and birds for money. Those 4,000 hectares are like a tumor that exterminates the local nature,” says Sanasaryan. Matevosyan, though, denies the circulating information asserting animals are bred under strict control and the hunting is done only for old male animals and only in permitted seasons. “In fact no one can prove animals are really bred on that territory. Let them leave the animals alone and they will reproduce themselves. And there is no best season for hunting. But it should be particularly excluded in spring time, because it’s a mating season. They say also they hunt only old animals unable to mate, but how do they see those details on a distance and learn is it allowed to be hunted or not?” mentions Adamyan, who also blames the National Academy of Sciences for giving positive evaluation to the Safari International’s activities. The NAS representatives confirm the approval they gave. However, they say, it was given with a condition that the bodies of the animals are given to the academy for research purposes. “A 3 year contract was signed as a result of our approval. But our cooperation lasted only 1.5 months. They gave 250,000 drams ($815), internal organs of one Bezoar goat and that was it,” says Georgi Boyakhchyan, adding the hunting would be organized even if they did not give the approval. Varantsov Barseghyan, deputy director of the Khosrov preserve does not refute many of the animals have been exterminated including those in his reserve. “The groups of animals include 20 species against 50-60 in former times. The wide spread poaching was in the late 80s and early 90s. Animal population almost halved in those years. As a result decades will be needed to restore the loss, despite it is also questionable,” the deputy director continued. He says, however, due to favorable natural and climate conditions and proper conservation the number of animals has grown in the recent years. Minister Harutyunyan also witnesses the growth of animal numbers with some exaggerations saying there is serious progress with the situation of the Bezoar goat and the mouflon. “We have a preserve where we give animals opportunities to reproduce in a conservation regime. These animals are also migrating so they are not hunted but come and go. We had also registered a wild boar, which proved the migration regime is provided. The problem is to provide the natural life of the animals,” Harutyunyan says. And while the minister tries to take pride in the results, the specialists voice concerns even if no mouflon or panther is hunted these animals are still endangered and will be totally exterminated in case of a minor error. “The number of animals should be at least 150-200 to keep the population. But even if the animals are not touched for at least 5 years their population will still be endangered. If it goes this way, panther, and even mouflon may vanish in several years,” says Manvelyan.